← Nepal’s earthquake – How can we help? A week after our return to Canada several of you are requesting a wrap up blog. I know we left you hanging in suspense – what would we get into next? Many of you know we returned safe and farmer tan brown. Others may be wondering if the wilds of Kea finally got the better of us! 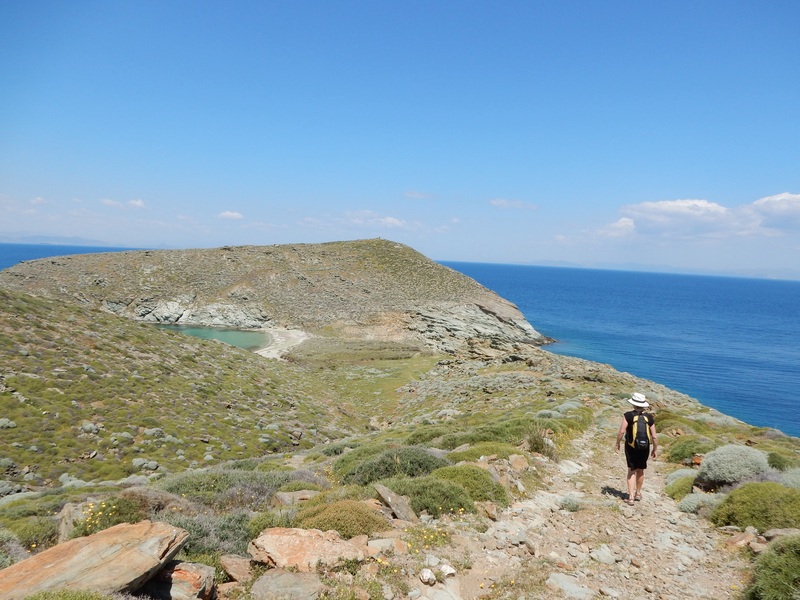 In brief – a few pictures of Our Final Day on Kea. Our last walk. And it was just a pleasant stroll to a pretty pocket beach (on the left) near where we were staying. The day was warm and perfect for sun bathing. So we did this thing – first and only time on the trip. Our very fine accommodation at the Red Tractor Farm. 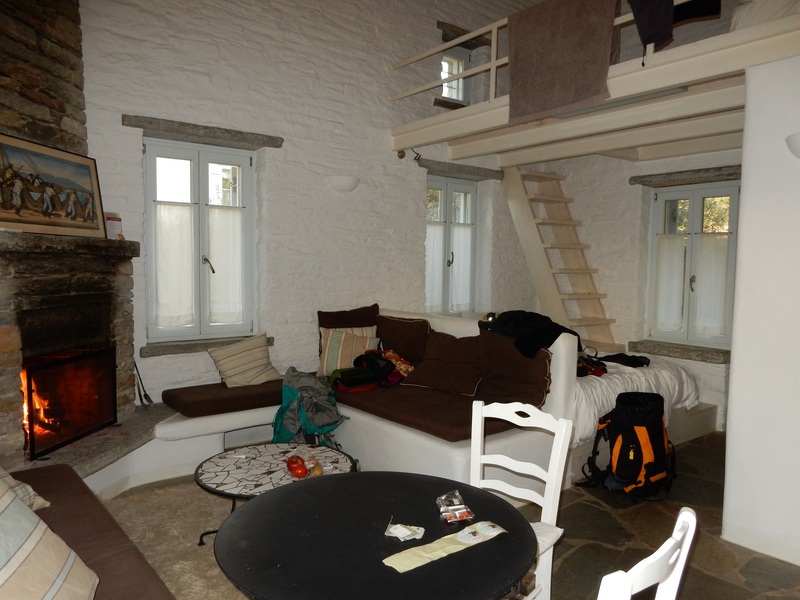 Besides this palatial room we had our own private courtyard garden as well as that balcony. And there was the kitchen. We lit a fire every evening as it was still cool at night. 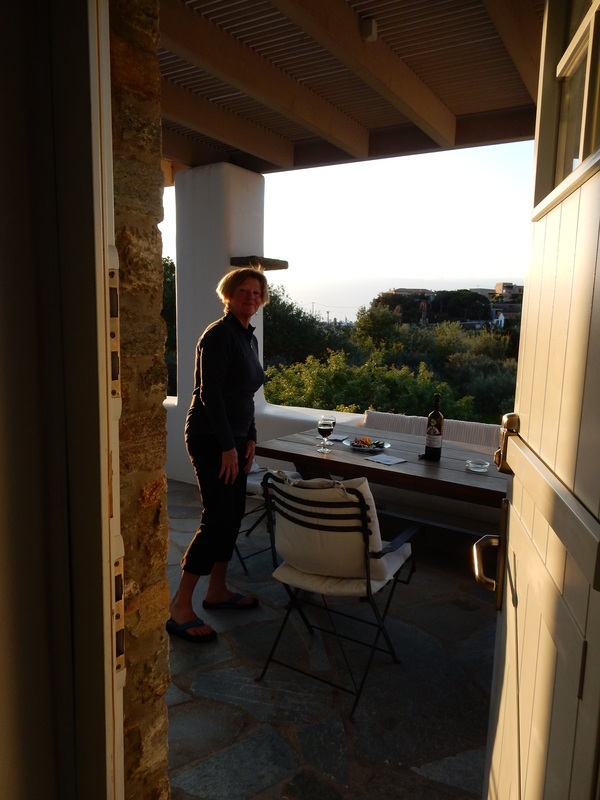 Kathy, our balcony, sunset of our final day….many of course more cheap, but good, wine. Kathy shopping for acorn cookies at the Red Tractor shop. This is where we stayed. Red Tractor is a viable farm, producing grapes for wine, and olives for olive oil. They also have an amazing project to save the oak trees of Kea. Fascinating story. Look up Acorn Progect Kea on Google if you’re interested. This is the port. Not our ferry but similar. When we left the next morning to catch our boat we walked the 15 minute journey with our head lamps to light our way as it was 6am and still dark! As mentioned, we departed at zero dark thirty. The ferry trip was about an hour. Two more hours and we were at the Athens airport. 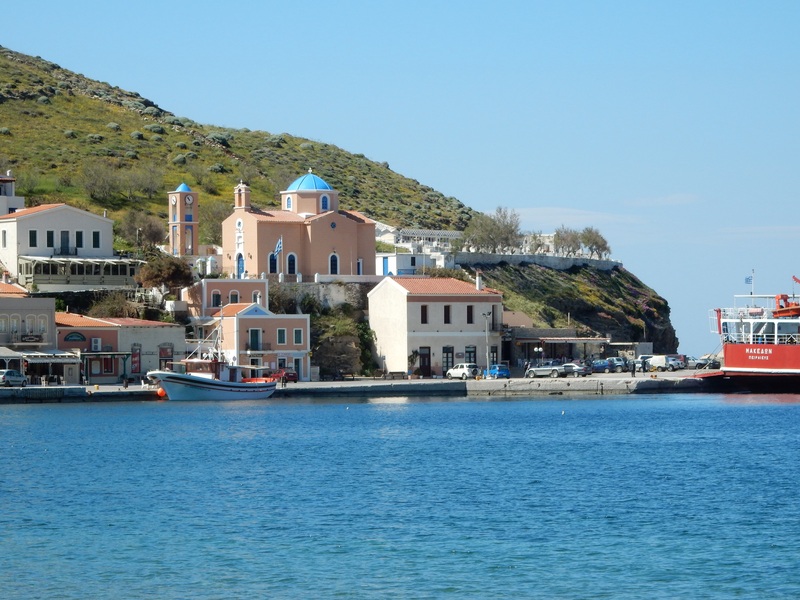 Plenty of time to zip into Athens for another quick look around….. But…. Despite the long wait for our check in time we chose to just sit in the sun outside the airport for a few hours. The trip into and out of Athens would have taken about as long as the time we’d have To look around. Neither of us are particularly city crazy and as you know we’d already enjoyed several Athenian highlights. Finally onto our flight to Amsterdam. Now we’d have endured a 17 hour layover there so had decided to add 24 hours to that – so just when you thought this was a wrap – there’s yet another day of surprises and delights. Next blog coming shortly to tell you about the joys of Amsterdam in the spring! Do bulbs come to mind? Just wait until you see. This entry was tagged acorn progect Kea. Bookmark the permalink.